Tony J. C. Wang, M.D., is the Co-Director of the Center for Radiosurgery and an Associate Professor of Radiation Oncology (in Neurological Surgery) at New York Presbyterian/Columbia University Irving Medical Center. He is recognized nationally for his extensive expertise in malignant and benign brain tumors. His research interests are in Gamma Knife stereotactic radiosurgery and brain tumors resulting in over 50 peer-reviewed publications. He has given over 50 invited lectures and visiting professorships nationally and internationally. He serves on several national and international working groups developing guidelines for brain tumor management and stereotactic radiosurgery. He is an editor for 2 radiation oncology textbooks and a writer for over 15 book chapters. He serves as an Associate Editor on the Radiation Oncology Section of Neurosurgery, the official journal of the Congress of Neurological Surgeons, and as a reviewer for International Journal of Radiation Oncology, Biology, and Physics, Practical Radiation Oncology, and Journal of Neuro-Oncology as well as many others. Dr. Wang received his B.A. and M.D. degrees from University of Missouri Kansas City Medical School, during which time he was also a Clinical Research Training Program Fellow at the National Institutes of Health, Bethesda, Maryland. He received internship training at Flushing Hospital Medical Center. Dr. Wang received his radiation oncology training at New York Presbyterian Hospital (Columbia campus), where he was Chief Resident from 2011-2012. 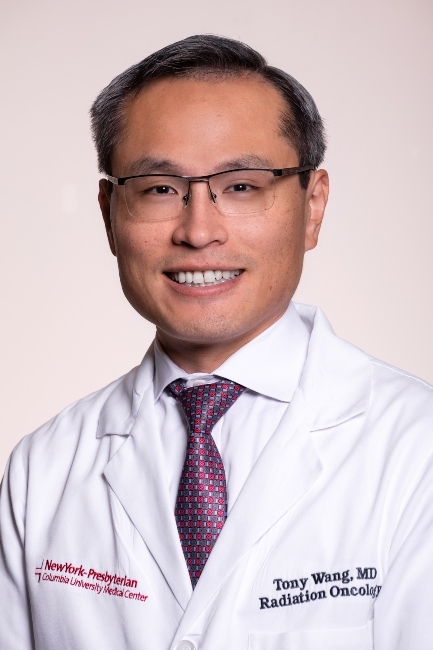 As a member of the Brain Tumor Center and Pituitary Tumor Center at Columbia, Dr. Wang is part of a multidisciplinary team that brings expertise from multiple specialties, including neurosurgery, neuro-oncology, neuroradiology, and neuro-endocrinology. Kruser TJ, Bosch WR, Badiyan SN, Bovi JA, Ghia AJ, Kim MM, Solanki AA, Sachdev S, Tsien C, Wang TJC, Mehta MP, McMullen KP. NRG brain tumor specialists consensus guidelines for glioblastoma contouring. Journal of Neuro-Oncology. 2019. Smith DR, Bian Y, Wu CC, Saraf A, Tai CH, Nanda T, Yaeh A, Lapa ME, Andrews JIS, Cheng SK, McKhann GM, Sisti MB, Bruce JN, Wang TJC. Natural history, clinical course and predictors of interval time from initial diagnosis to development of subsequent NSCLC brain metastases. Journal of Neuro-Oncology. 2019. Sperduto PW, Fang P, Li J, Breen W, Brown PD, Cagney D, Aizer A, Yu J, Chiang V, Jain S, Gaspar LE, Myrehaug S, Sahgal A, Braunstein S, Sneed P, Cameron B, Attia A, Molitoris J, Wu CC, Wang TJC, Lockney N, Beal K, Parkhurst J, Buatti JM, Shanley R, Lou E, Tandberg DD, Kirkpatrick JP, Shi D, Shih HA, Chuong M, Saito H, Aoyama H, Masucci L, Roberge D, Mehta MP. Survival and Prognostic Factors in patients with gastrointestinal cancers and brain metastases: have we made progress? Translational Research. 2019. Wang TJC. Book Review: Adult cns radiation oncology: principles and practice. Neurosurgery. 2019. Ivanov VN, Wu J, Wang TJC, Hei TK. Inhibitoin of atm kinase upregulates levels of cell death induced by cannabidiol and γ-irradiation in human glioblastoma cells. Oncotarget. 2019; 10:825-846. Yanagihara TK, McFaline-Figueroa JR, Giacalone NJ, Lee AW, Soni V, Hwang ME, Hsieh KT, Saraf A, Wu CC, Yang D, Wen PY, Ashamalla H, Aizer AA, Wang TJC, Huang RY. A low percentage of metastases in deep brain and temporal lobe structures. Neuro-Oncology. 2019. Buss EJ, Wang TJC. Treatment of lung adenocarcinoma brain metastases: what is the role of radiotherapy in the age of precision medicine? Translational Lung Cancer Research. 2018; 7:S318-320. Wang TJC, Mehta MP. Low-grade glioma radiotherapy treatment and trials. Neurosurgery Clinics of North America. 2019; 30:111-118. Yanagihara TK, Wang TJC. Commentary: long-term hearing outcomes following stereotactic radiosurgery in vestibular schwannoma patients – a retrospective cohort study. Neurosurgery. 2018. Schulte JD, Hargus G, Canoll P, Sisti MB, Wang TJC, Lignelli A, Lassman AB. Clinical reasoning: transient speech deficits in a patient with history of medulloblastoma. Neurology. 2018; 12:e1196-e1201. Black PJ, Smith DR, Chaudhary K, Xanthopoulos EP, Chin C, Spina CS, Hwang ME, Mayeda M, Wang YF, Connolly EP, Wang TJC, Wuu CS, Hei TK, Cheng SK, Wu CC. Velocity-based adaptive registration and fusion for fractionated stereotactic radiosurgery using the small animal radiation research platform. International Journal of Radiation Oncology, Biology and Physics. 2018; 102:841-847. Okunieff P, Casey-Sawicki K, Lockney NA, Hoppe BS, Enderling H, Pinnix CC, Welsh JW, Krishnan S, Yothers G, Brown JM, Knox SJ, Bristow RG, Spellman PT, Mitin T, Nabavizadeh N, Jaboin J, Manning HC, Feng FY, Galbraith SM, Solanki AA, Harkenrider MM, Tuli R, Decker RH, Finkelstein SE, Hsu CC, Ha CS, Jagsi R, Shumway D, Daly M, Wang TJC, Fitzgerald TJ, Laurie F, Marshall DT, Raben D, Constine LS, Thomas CR, Kachnic LA. Report from the swog radiation oncology committee: research objectives workshop 2017. Clinical Cancer Research. 2018; 24:3500-3509. Rae AI, Mehta A, Cloney M, Kinslow CJ, Wang TJC, Bhagat G, Canoll PD, Zanazzi GJ, Sisti MB, Sheth SA, Connolly ES, McKhann GM, Bruce JN, Iwamoto FM, Sonabend AM. Craniotomy and survival for primary central nervous system lymphoma. Neurosurgery. 2019; 84:935-944. Kinslow CJ, Bruce SS, Rae AI, Sheth SA, McKhann GM, Sisti B, Bruce JN, Sonabend AM, Wang TJC. Solitary-fibrous tumor/hemangiopericytoma of the central nervous system: a population-based study. Journal of Neuro-Oncology. 2018; 138:173-182. Tai CH, Wu CC, Hwang ME, Saraf A, Grubb C, Jani A, Lapa ME, Andrews JIS, Isaacson SR, Sonabend AM, Sheth SA, McKhann GM, Sisti MB, Bruce JN, Cheng SK, Connolly EP, Wang TJC. Single institution validation of a modified graded prognostic assessment of patients with breast cancer brain metastases. CNS Oncology. 2018; 7:25-34. Wang TJC, Brown PD. Brain metastases: fractionated whole-brain radiotherapy. Handbook of Clinical Neurology. 2018; 149:123-127. Nanda T, Yeah A, Wu CC, Jani A, Saad S, Qureshi YH, Cauley KA, Lesser J, Cheng SK, Isaacson SR, Sisti MB, Bruce JN, McKhann GM, Sheth SA, Lassman AB, Wang TJ. Local control and overall survival for adjuvant stereotactic radiosurgery in patients with residual or recurrent disease. Journal of Neuro-Oncology. 2018; 136:281-287. Nanda T, Wu CC, Campbell AA, Bathras RM, Jani A, Kazim M, Wang TJ. Risk of dry eye syndrome in patient striated with whole-brain radiotherapy. Medical Dosimetry. 2017; 42:357-362. Garrett MD, Yanagihara TK, Yeh R, McKhann GM, Sisti MB, Bruce JN, Sheth SA, Sonabend AM, Wang TJ. Monitoring radiation treatment effects in glioblastoma: flair volume as significant predictor of survival. Tomography. 2017; 3:131-137. Wu CC, Chaudhry KR, Na YH, Welch D, Black PJ, Sonabend AM, Canoll P, Sanger YM, Wang TJC, Wuu CS, Hei TK, Cheng SK. Quality assessment of stereotactic radiosurgery of a melanoma brain metastases model using a mouse-like phantom and the small animal radiation research platform. International Journal of Radiation Oncology, Biology and Physics. 2017; 99:191-201. Smith DR, Wu CC, Wang TJC. Stereotactic radiosurgery for treatment of multiple brian metastases: remembering to spare the hippocampus? In regard to Zhang et al. Practical Radiation Oncology. 2017; 7:446-447. Saraf A, Grubb CS, Hwang ME, Tai CH, Wu CC, Jani A, Lapa ME, Andrews, JIS, Vanderkelen S, Isaacson SR, Sonabend AM, Sheth SA, McKhann GM, Sisti MB, Bruce JN, Cheng SK, Connolly EP, Wang TJC. Breast cancer subtype and stage are prognostic of time from breast cancer diagnosis to brain metastasis development. Journal of Neuro-Oncology. 2017; 134:453-463. Wu CC, Smith DR, Chin C, Wang TJ. The success of nrg-gbm-rpa: biomarker-based classification, where to next? Translational Cancer Research. 2017; 6:S541-543. Perni S, Wang TJ, Lesser J, Mandigo C, Isaacson SR, Horowitz DP. Gamma knife treatment of recurrent CNS metastases of pancreatic origin: a case report and review of the literature. CNS Oncology. 2017; 6:111-118. Wu CC, Wuu YR, Jani A, Saraf A, Tai CH, Lapa ME, Andrew JIS, Tiwari A, Saadatmand HJ, Isaacson SR, Cheng SK, Wang TJC. Whole-brain irradiation field design: a comparison of parotid dose. Medical Dosimetry. 2017; 42:145-149. Kinslow CJ, Rajpara RS, Wu CC, Bruce SS, Canoll PD, Wang SH, Sonabend AM, Sheth AM, McKhann GM, Sisti MB, Bruce JN, Wang TJC. Invasiveness is associated with metastasis and decreased survival in hemangiopericytoma of the central nervous system. Journal of Neuro-Oncology. 2017; 133:409-417. Yanagihara TK, Lee A, Wang TJ. Quantitative analysis of the spatial distribution of metastatic brain lesions. Tomography. 2017; 3:16-22. D'Amico RS, Zanazzi G, Hargus G, Dyster T, Chan S, Lignelli-Dipple A, Wang TJ, Faust PL, McKhann GM. Intracranial intraaxial cerebral tufted angioma: case report. Journal of Neurosurgery. 2018; 128:524-529. D'Amico RS, Banu MA, Petridis P, Bercow AS, Malone H, Praver M, Wang TJ, Isaacson SR, Sisti MB. Efficacy and outcomes of facial nerve-sparing treatment approach to cerebellopontine angle meningiomas. Journal of Neurosurgery. 2017; 127:1231-1241. Gittleman H, Lim D, Kattan MW, Chakravarti A, Gilbert MR, Lassman AB, Lo SS, Machtay M, Sloan AE, Sulman EP, Tian D, Vogelbaum MA, Wang TJ, Penas-Prado M, Youssef E, Blumenthal DT, Zhang P, Mehta MP, Barnholtz-Sloan JS. An independently validated nomogram for individualized estimation of survival among patients with newly diagnosed glioblastoma: nrg oncology rtog 0525 and 0825. Neuro-Oncology. 2017; 19:669-677. Yanagihara TK, Saadatmand HJ, Wang TJ. Reevaluating stereotactic radiosurgery for glioblastoma: new potential for targeted dose-escalation. Journal of Neuro-Oncology. 2016; 130:397-411. Garrett MD, Wu CC, Yanagihara TK, Jani A, Wang TJ. Radiation therapy for the management of brain metastases. American Journal of Clinical Oncology. 2016; 39:416-422. Jani A, Wang TJ, Sisti MB. In reply: how long should we wait for delivery treatment after surgery? An enigma yet to be solved. Neurosurgery. 2016; 79:E166-167. Saadatmand HJ, Wu CC, Wang TJ*. Interdisciplinary management of acoustic neuromas. Applied Radiation Oncology. 2016; 5(1):5-16. Wu CC, Wang TJ, Jani A, Estrada J, Ung T, Chow DS, Soun J, Saad S, Qureshi YH, Gartrell R, Saadatmand HJ, Saraf A, Garrett MD, Grubb C, Isaacson SR, Cheng SK, Sisti MB, Bruce JN, Sheth SA, Lassman AB, McKhann GM. A modern radiotherapy series of survival in hispanic glioblastoma patients. World Neurosurgery. 2016; 88:260-269. Grubb CS, Jani A, Wu CC, Saad S, Qureshi YH, Nanda T, Yaeh A, Rozenblat T, Sisti MB, Bruce JN, McKhann GM, Sheth SA, Lesser JA, Cheng SK, Isaacson SR, Lassman AB, Connolly EP, Wang TJ*. Breast cancer subtype as a predictor for outcomes and control in the setting of brain metastases treated with stereotactic radiosurgery. Journal of Neuro-Oncology. 2016; 127:103-110. Wang TJ, Jani A, Estrada JP, Ung TH, Chow DS, Soun JE, Saad S, Qureshi YH, Gartrell R, Isaacson SR, Cheng SK, McKhann GM, Bruce JN, Lassman AB, Cheng SK, Sisti MB. Timing of adjuvant radiation therapy in glioblastoma patients: a single-institution experience with more than 400 patients. Neurosurgery. 2016; 78:676-682. Wu CC, Horowitz DP, Deutsch I, Rahmati R, Schecter JM, Saqi A, Wang TJ*. De-escalation of radiation dose for hpv-positive oropharyngeal head and neck squamous cell carcinoma: a case report and preclinical and clinical literature review. Oncology Letters. 2016; 11:141-149. Wang TJ, Wu CC, Chai Y, Lam RK, Hamada N, Kakinuma S, Uchihori Y, Yu PK, Hei TK. Induction of non-targeted stress response in mammary tissues by heavy ions. PLoS One. 2015; 10(8):e0136307. Yaeh A, Nanda T, Rozenblat T, Jani A, Qureshi Y, Saad S, Lesser J, Lassman AB, Isaacson SR, Sisti MB, Bruce JN, McKhann GM, Wang TJ*. Control of brain metastases from radioresistant tumors treated by stereotactic radiosurgery. Journal of Neuro-Oncology. 2015; 124:507-514. Wang TJ, Saad S, Qureshi YH, Jani A, Nanda T, Yaeh AM, Rozenblat T, Sisti MB, Bruce JN, McKhann GM, Lassman AB, Cheng SK, Isaacson SR. Does lung cancer mutation status and targeted therapy predict for outcomes and local control in the setting of brain metastasis treated with radiation?. Neuro-Oncology. 2015; 17:1022-1028. Jani A, Rozenblat T, Yaeh AM, Nanda T, Saad S, Qureshi YH, Feng W, Sisti MB, Bruce J, McKhann GM, Lesser J, Lassman AB, Isaacson SR, Wang TJ*. The energy index does not affect local control of brain metastases treated by gamma knife stereotactic radiosurgery. Neurosurgery. 2015; 77:119-125. Wang TJ, Riaz N, Lee NY. Dorsal vagal complex of the brainstem: conformal avoidance to reduce nausea In Regard to Monroe et al. Practical Radiation Oncology. 2015; 5:e57. Wang TJ, Saad S, Qureshi YH, Isaacson SR, Sisti MB, Bruce JN, McKhann GM, Lesser J, Cheng SK, Chao KS, Lassman AB. Outcomes of gamma knife radiosurgery, bi-modality & trimodality treatment regimens for patients with one or multiple brain metastases: the Columbia University Medical Center experience. Journal of Neuro-Oncology. 2015; 122:399-408. Saad S, Wang TJ*. Neurocognitive deficits after radiation therapy for brain malignancies. American Journal of Clinical Oncology. 2015; 38:634-640. Yanagihara T, Wang TJ*. Diffusion weighted imaging of the brain for glioblastoma, implications for radiation- and neurooncology. Applied Radiation Oncology. 2014; 3(4):5-13. Saad S, Wang TJ*. Nasopharyngeal carcinoma: current treatment options and future directions. Journal of Nasopharyngeal Carcinoma. 2014; 1:e16. Horowitz DP*, Wang TJ*, Wuu CS, Feng W, Drassinower D, Lasala A, Pieniazek R, Cheng S, Connolly EP, Lassman AB. Fetal radiation monitoring and dose minimization during intensity modulated radiation therapy for glioblastoma in pregnancy. Journal of Neuro-Oncology. 2014; 120:405-409. Riaz N, Hong JC, Sherman EJ, Morris L, Fury M, Ganly I, Wang TJ, Shi W, Wolden SL, Jackson A, Wong RJ, Zhang Z, Rao SD, Lee NY. A nomogram to predict loco-regional control after re-irradiation for head and neck cancer. Radiotherapy and Oncology. 2014; 11:382-387. Wang TJ, Riaz N, Zhang C, Youssef B, Hong JC, Born H, Wolden S, Rao S, Lee NY. Patterns of failure (pof) after salvage re-irradiation for recurrent head and neck: implications for field design and consolidation therapy. Journal of Radiation Oncology. 2014; 3:139-145. Wang TJ, Zhang C, Wei Y, Kessel J, Chao KS, Hei TK, Deutsch I. Comparison of effect of rectal volume delineation methods on dose constraint endpoints in the treatment of prostate cancer with intensity-modulated radiation therapy. Journal of Radiation Oncology. 2013; 2:303-308. Wang TJ, Fontenla S, McCann P, Young RJ, McNamara S, Rao S, Mechalakos JG, Lee NY. Correlation of planned dose to area postrema and dorsal vagal complex with clinical symptoms of nausea and vomiting in a series of oropharyngeal cancer (opc) patients treated with radiation alone using IMRT. Journal of Radiation Oncology. 2013; 2:407-412. Wang TJ, Menda Y, Cheng SK, Wu CC, Lee NY. New Tracers PET in Head and Neck Squamous Cell Carcinoma. PET Clinics. 2012; 7:431-441. Wang TJ, Riaz N, Cheng SK, Lu JJ, Lee NY. Intensity-Modulated Radiation Therapy for Nasopharyngeal Carcinoma: A Review. Journal of Radiation Oncology. 2012; 1:129-146. Jia Y, Wang TJ, Allendorf J, Saif MW. Management of borderline resectable pancreatic adenocarcinoma. Journal of the Pancreas. 2012; 13:147-150. Wang TJ, Lee NY, Young RJ. An unusual cause of isolated vomiting. Neurology. 2012; 78:72-73. Wang TJ, Brisman R, Lu ZF, Li X, Isaacson SR, Shah JN, Yoshida EJ, Liu T. Image registration strategy of T(1)-weighted and FIESTA MRI sequences in trigeminal neuralgia gamma knife radiosurgery. Stereotactic and Functional Neurosurgery. 2010; 88:239-245. Liu T, Zhou J, Yoshida EJ, Woodhouse SA, Schiff PB, Wang TJ, Lu ZF, Pile-Spellman E, Zhang P, Kutcher GJ. Quantitative ultrasonic imaging of radiation-induced late tissue toxicity: pilot study in breast-cancer radiotherapy. International Journal of Radiation Oncology, Biology and Physics. 2010; 78:811-820. Zhao W, Chuang EY, Mishra M, Awwad R, Bisht K, Sun L, Nguyen P, Pennington JD, Wang TJ, Bradbury CM, Huang L, Chen Z, Bar-Sela G, Robbins ME, Gius D. Distinct effects of ionizing radiation on in vivo murine kidney and brain normal tissue gene expression. Clinical Cancer Research. 2006; 12:3823-3830. Pennington JD, Wang TJ, Nguyen P, Sun L, Bisht K, Smart D, Gius D. Redox sensitive signaling factors as a novel molecular targets for cancer therapy. Drug Resistance Updates. 2005; 8:322-330.